Recorded at Array Space, July 23, 2017. This cozy Sunday night of "Over the Edge" improvisations was convened by Bill Gilliam to give five players each a couple chances to combine in different duos and trios. 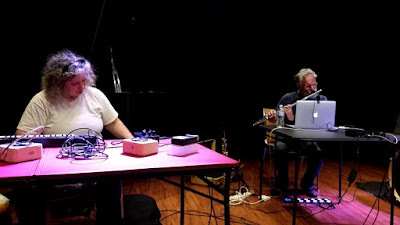 Between the bookending trios that started and ended the night, there were a pair of duo encounters, the first of which mixed Allison Cameron's acoustic instruments (flute, banjo) with Glen Hall's processed wind-sounds.